Although you'll find details of what visible things are found in our Universe elsewhere on this site, the actual Universe itself - as an object - merits a page of its own. There are many unknowns regarding the Universe - numerous strange theories and, yes, guesses abound. A few of the concepts detailed on this page will prove a bit difficult to get your head around. Also, it'll be necessary to consider the theorems of some of the most famous physicists in history and, hopefully, I'll be able to reduce them to easy-to-understand terms. Simulation of the observable Universe. Each white dot represents a collection of superclusters of galaxies. The diameter of the sphere is 93 billion light years. Notice the graphic above is of our observable Universe? Due to the time limit of the speed of light, some objects may be so far away that light from them hasn't had time to reach us yet. It is therefore postulated that the actual Universe may be far bigger than that portion we can actually observe. This is impossible to verify, however, because, until data does reach us, we just don't know! 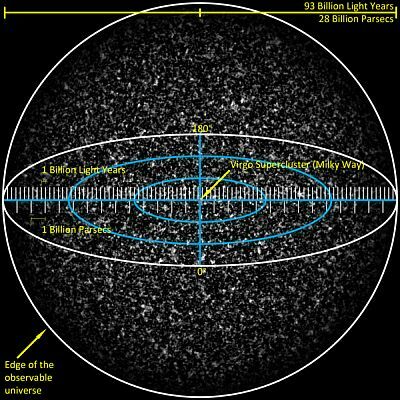 Assuming that, immediately after the Big Bang, the Universe began expanding at the speed of light, then it is a simple matter to multiply that by its estimated age of 13.75 billion years, resulting in an actual size some 100,000 million million million times larger than the bit we can see! Believe it or not, the stars, galaxies, nebulae and interstellar dust - visible stuff - collectively make up only 5% of our Universe! Yes, as you can see by the above chart, most of the Universe consists of "dark energy", with the next largest portion being "dark matter". These two things are concepts only. In other words, they are invisible and undetectable, so their actual existence can only be theoretical. They've been "made up", in effect, to explain the gravitational properties of the stars and galaxies, in their relation to the Universe as a whole. The dark matter is said to be pulling the galaxies together, while the dark energy is thought to be driving the Universe's expansion. It is slightly alarming that most of our Universe is made of something that scientists basically know absolutely nothing about! Before venturing any further into the weird and wonderful world of our Universe, there are certain scientific concepts that you should be aware of. Sorry if this seems like it's turning into a science lesson. When you look round your environment, you see things, obviously, in three dimensions - height, width and depth. Things happen with the passage of time, which is separate from these dimensions. In outer space, time has to be included as a fourth dimension, linked to the other three. This is because, across the gulfs of the Universe, the flow of time can vary, due to the speed of something relative to its observer and the effect of any local gravitational fields. 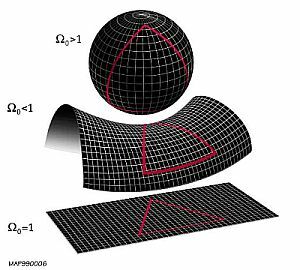 Thus, we have the concept of the four-dimensional "space-time", or the "space-time continuum", whereby an object's coordinates are not only "where", but "when". The everyday world, everything we see around us, is governed by the Newtonian laws of physics. Formulated by Sir Isaac Newton in the 17th century, they explain things like, when you let go of an object, it falls to the ground. All nice and familiar. However, if you delve down into the subatomic level of matter, dealing with inconceivably small particles, you have then entered the quantum domain and things are very, very different. Everything appears totally random. Particles are popping in and out of existence and some travel faster than the speed of light. All impossible within the laws of Newtonian physics, but here, in the quantum world, apparently, anything goes. Bearing in mind that the genius that was Albert Einstein took ten years to formulate this theory, I'm going to try and explain it in a few sentences and in easy to understand terms. Wish me luck! So, you're sitting at your computer, reading this. You may consider that you're motionless. Of course you are - you're sat in a seat! But - and this is one of the key things in the theory of relativity - you're only motionless relative to the planet Earth. The Earth is, in fact, in motion, spinning around its axis. At the equator, the surface is actually moving at around 1,000 miles per hour, relative to the space around it. But our planet is also orbiting the Sun at a speed of about 66,000 miles per hour, relative to the Sun. But it doesn't end there! The Sun itself is orbiting the Milky Way galaxy at a staggering 483,000 miles per hour! So, the motion of anything is always relative to the position and speed of the observer. That's one concept of "relativity". Another aspect of this theory is the concept that the speed of light remains constant under any circumstances. You may think, if you're in a car going at 100 miles per hour and turn on the headlights, the light coming out from them will be travelling at light speed, 186,000 miles per second, plus the 100 miles per hour that the car is travelling. But no. It is still at its constant speed. The only way to get round this paradox is to suggest that, at very high velocities, time moves more slowly and length shortens, to keep the light speed constant, relative to the observer. This phenomenon of time slowing down the faster an object moves has been demonstrated by an experiment carried out in 1971. Two extremely sensitive atomic clocks were used, each on airplanes travelling in opposite directions. At the end of the flights, they showed slightly different times. Okay, only by a few milliseconds, but that was enough proof. This phenomenon is known as "time dilation". Einstein first came up with his Special Theory of Relativity, which applied only to objects travelling in a straight line, at a constant speed. Eventually, he added his General Theory, to cover all other conditions. This is a very small measurement of length, considered by some to be the smallest measurable length possible. It's arrived at by combining three fundamental universal constants: the Planck constant, the gravitational constant and the speed of light. Please, don't expect me to go into those three values more deeply; your brain would explode. Its length is 0.000000000000000000000000000000000016 metres. That's very small indeed, as I think you'll agree. It's actually 10 million million million million times smaller than an atom. As it is derived from universal constants, it is a constant itself, which sort of contradicts Einstein's Theory of Relativity, which proposes that length isn't contant. Either his theory will have to be amended, or the length is too minuscule for it to matter. The "strings" that make up string theory are said to operate at the Planck length level. This, simply explained, means that some particle interactions, or the particles themselves, are too small or short lived to be measured. Thus it is impossible to predict what they will do or formulate scientific laws about them. Here comes another of those "get your head round it" moments. You may think that, as our Universe originated from a single point as the Big Bang, its subsequent expansion would result in its shape being spherical. Needless to say, it's not as simple as that. There were three different possibilities proposed for the shape of the Universe - open, closed or flat. To appreciate what each of these mean, you need to be aware that the Universe is three-dimensional, expanding in four dimensions. The most our human minds can grasp is a two-dimensional Universe (like the surface of a balloon as it is inflated), expanding in three dimensions. Once you can accept this concept, the three possible Universe shapes might make more sense. The closed Universe (at the top of the diagram) can be thought of as a sphere. When you draw a circle on a piece of paper, it could be considered a two-dimensional sphere, possessing height and width only. Something like a ball or a planet is a three-dimensional sphere, adding depth to the mix. The Universe, however, takes the sphere shape to a fourth dimension - and, as I said earlier, you can't really visualise that, can you? The bottom line with this is that, if you set off on a spacecraft and travelled in a straight line, you'd eventually end up back where you started. The red triangle superimposed on it would contain internal angles that added up to more than 180 degrees. The open version (in the centre), has negative curvature (triangles' angles adding up to less than 180 degrees) and is, theoretically, without boundaries. The bottom one in the diagram, the flat Universe, is also open and without boundaries. Triangles display the properties found in school geometry - their angles add up to 180 degrees, just like they should. The Ω sign in the diagram represents the "density parameter" (don't ask) of the Universe. The space probe Explorer 80 (or WMAP - Wilkinson Microwave Anisotropy Probe) has measured this fairly accurately and found it to be very close to a value of one. This suggests that we are living in a 4-dimensional flat Universe. Not ended up with a headache, I hope! What? The Universe is black with stars twinkling in it, isn't it? Well, yes, but this colour of our Universe is determined by examining the colour of all the various galaxies and stars in a large portion of the observable Universe and sort of averaging it out. The result was...beige. Yes, the Universe is beige! Its official name is "cosmic latte", voted upon by the scientists at John Hopkins University, in Baltimore, USA, where the research took place. This is postulated as the "stuff" from which the fabric of the Universe is ultimately made. Existing at the Planck length level of the quantum domain, it represents constant fluctuation and disturbance in space-time. Particles are coming into existence and disappearing entirely randomly, as are miniature black holes. At these incredibly small scales, Heisenberg's Uncertainty Principle comes into play and thus the law of conservation of energy is not violated (thank goodness). It is thought that wormholes exist within this foam, too, making the possibility of passing through them to parallel universes a possibility, if their size could, one day, be expanded to accept a human. Needless to say, any man-sized wormhole, if it does turn out to be a possibility, will be many many years in the future. Where is the Centre of Our Universe? This is what I used to think: the Universe was created, in the Big Bang, from a single point, so, if we find where this single point is within the Universe today, then that must be its centre. Seems logical, doesn't it? As you'd expect, that's not the situation at all. There is no space outside the Universe for it to expand into. There is no existence outside of the Universe. What is actually happening is that space itself is expanding, so, in effect, space is being created with the expansion. Therefore, that original single point has now expanded to be everywhere in the Universe. The centre of the Universe could be considered to be right in front of your face - or in the middle of the Andromeda Galaxy. In other words, it is everywhere, because "everywhere" originated from the single point of the Big Bang. Yet more "get your head round" stuff, eh? Assuming the Universe is flat, as discussed above, its expansion will continue until one of two things happen. Firstly, the "Big Freeze", which postulates that, as the expansion continues, the Universe will gradually cool down. It will pass through a "degenerate era", when all star creation ceases, then a "black hole" era. Eventually, these objects will dissolve away, forming the "dark era". Subsequently, the Universe will experience heat death. Secondly, the "Big Rip". This assumes the existence of a special form of dark energy called "phantom energy". This will simply cause the Universe's expansion to increase at an exponential rate, eventually tearing it apart. All stars and planets would suffer this fate, culminating with all the remaining atoms of matter being destroyed.